Nancy Holt's SUN TUNNELS (1973-1976) is considered her best work. It consists of four (4) perforated large concrete pipes placed in an open 'X' configuration with 50 feet in between opposing pipes, in the Utah's Great Basin Desert, and marking the positions of the solstitial sunrises and sunsets. Holts identified the site with a passage from T.S. Eliot's The Waste Land (1922): "Dawn points, and another day/ Prepares for heat and silence." 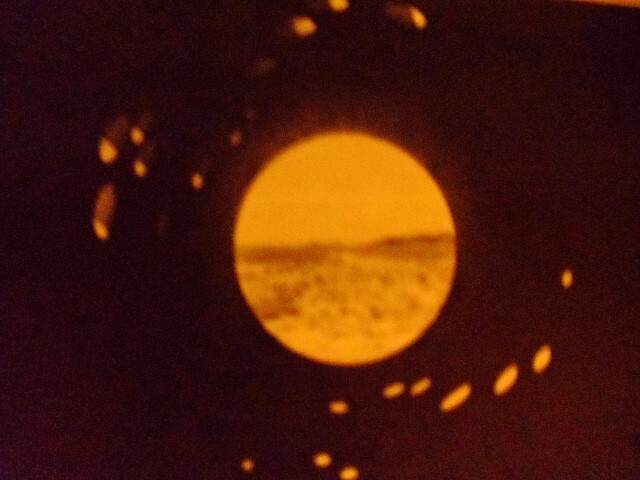 The image above shows a midafternoon view in July through the northwest tunnel (with holes cut in the configuration of the constellation Draco). The spots of light change shape and move across the bottoms of the pipes as the sun or moon passes overhead. Holt described the effect of these spots of light inside the tunnels: "Day is turned into night, and an inversion of the sky takes place: Stars are cast down to Earth, spots of warmth in cool tunnels". Land art pioneer and video artist, Nancy Holt died on February 8, 2014 at the age of 75. She had recently finished postproduction on a documentary film about the completion of Amarillo Ramp, an earthwork that her husband Robert Smithson was working on when he died in 1973.